Friday 6 June 2008 -- Mr Ian Thomson has been appointed by the Secretariat of the Pacific Community (SPC) to coordinate its work on the Pacific Rural Internet Connectivity System (Pacific RICS) and Oceania One Laptop Per Child (OLPC) projects. The Pacific RICS aims to provide Internet access to rural and remote Pacific communities that are currently not serviced by commercial operators. The technology uses small 1.2 or 1.8 metre satellite dishes and therefore requires low power to operate, which means it can be solar powered. A 'network-in-a-box' server provides the networking capability that allows Internet connectivity, a laser printer, WIFI wireless access and computers networked via cables. Ian will be establishing the 16 RICS pilot sites across the region. The first site was launched a month ago in Gaire, a rural community located an hour's drive southeast drive of Port Moresby. The other pilot site in Papua New Guinea is in Bougainville, with the remaining sites in Cook Islands, Kiribati (2), Federated States of Micronesia, French Polynesia, Marshall Islands, Nauru, Samoa, Solomon Islands (2), Tokelau, Tuvalu, Tonga and Vanuatu. The Oceania OLPC initiative, another component of Ian's work for SPC, consists of a pilot roll-out where 5000 OLPC laptops will be distributed to remote and rural areas in the Pacific, connected through RICS. Pacific governments and private sector stakeholders, as well as non-governmental organisations and other development partners, are being approached to collaborate to come up with the necessary funding to obtain a minimum of 100,000 units, which will cost approximately USD 200 each. Ian says, 'We are going to Gaire next week with David Leeming, a project consultant specially hired to help with the roll-out of the Oceania OLPC programme. We will start with providing laptops to 30 children in one class and hopefully by the end of the year we will have laptops for every child at the primary school. 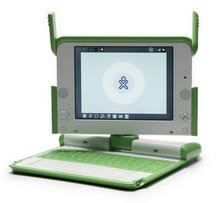 We consider every RICS site to be an OLPC hub. 'Recently we went to Boston [USA] to discuss the OLPC Oceania programme at MIT [Massachusetts Institute of Technology - OLPC headquarters]. We also looked at ways other countries, such as Peru, Uruguay and Pakistan, have gone about implementing their roll-out programme. It was very inspirational and we got lots of good ideas. Ian will be based in Noumea, New Caledonia, and his wife, Sherrin, and three daughters plan to visit as much as possible from their home in New Zealand. For more specific information, please email Ian Thomson, Coordinator for VSAT and Community Information Centres, at iant at spc.int or phone him on +687 262000, or email Rosita Hoffmann, SPC Communications and Public Relations Adviser, at rositah at spc.int.